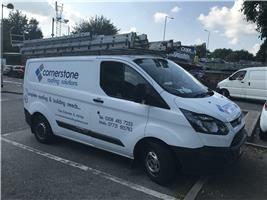 Corner Stone Roofing Solutions - Fascia/Soffits/Guttering, Roofer, Windows/Doors/Conservatories based in Ripley, Surrey. Cornerstone Roofing Solutions is one of the leading roofing companies in Surrey and the London area. Having experience for over 15 years you can rest assured that all of our team are professional experienced tradesmen. We pride ourselves in everything we do, making sure we give our customers 100% with a full guarantee, we are also fully insured. This allows you to rest assured that you have picked a team, that are reliable and work to the highest of standards. We do not take short cuts, allowing you as the customer to have a roofer that you can trust. We have experience in all sizes of jobs from large roofs to small homes. From Velux windows, flat roofs, new roofs to roof repairs. No job is too large or small.